Yesterday, my email inbox exploded from notifications coming in that resulted from a tweet written by Caroline Lawrence, which turned out to be immensely popular. 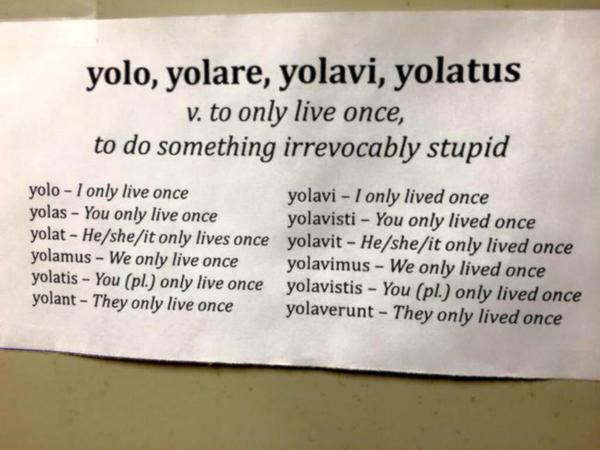 There are a number of people out there, who think that Horace’s famous carpe diem (‘seize the day’) is a good translation or equivalent of YOLO (in terms of capturing the acronym’s gist). Let us live, my Lesbia, and let us love, and let us disdain the gossip of those oh-so-very-stern old men ! Suns may set and return again: when the brief light of our time sets once, it is for us to sleep through an eternal night. Give me a thousand kisses, then a hundred, then another thousand, then one hundred. Then, when we made it many a thousand, let us lose track, lest we know, or lest someone evil may become envious, as he would be, if he got to learn just how many kisses there were. dimisisse meas sero non ingemit horas? Attend to me. The life of man fleets fast away, and no man can be born a second time; time flies, and the stream of death carries us away and forbids us to carry to the lower world the things that gave us pleasure in life. Who, when his last hour comes, does not regret too late that he let slip the seasons of Pleasure? This passage forms the end of a speech delivered by personified Voluptas–Pleasure, directed at Scipio Africanus – a speech, to which a significantly less fun-filled figure of Virtus–Virtue gets to respond, promising lasting glory through hard, self-sacrificing devotion. Not much of an advocate for the YOLO style of life on this occasion, Scipio Africanus chooses to follow the path of virtue – just like the mythical Hercules did, when he was given the same choice (a story that Silius shamelessly plagiarised). But then, as those who study the life and exploits of Scipio Africanus in more detail will know, Scipio in his actions, tactics, and military endeavours in real life (as opposed to Silius’ epic) does not appear to have been consistently averse to ‘YOLO = to do something irrevocably stupid’, either. This entry was posted in Poetry and tagged Catullus, Scipio Africanus, Silius Italicus, YOLO, You Only Live Once. Bookmark the permalink.